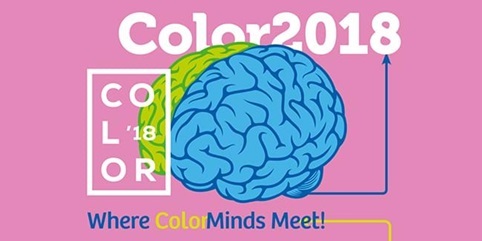 The Color Conference ’18, hosted by the Printing Industries of America (PIA) January 13–16 in San Diego was a great success for JUST Normlicht. In addition to sponsoring the event, JUST demonstrated its award winning JUST LED moduLight ISO compliant lighting to a wide range of leaders from color management experts to brand and product managers. JUST’s James Summers, VP for the America’s business, addressed the audience with a presentation Illuminating Advancements in LED Lighting. He helped explain the changes and impact LED based lighting is having on consumers, retailers, brand managers and graphic production professionals and what can be done to proactively plan for and incorporate these changes. Mr. Summers participated in a lively discussion on color standards that helped the audience learn about differences between general LED lighting and the patented JUST approach which exceeds the requirements of the ISO 3664:2009 viewing standard. 2017 December // JUST News. With the relocation of Fogra into the new institute building in Munich, Fogra has also upgraded its viewing station. In terms of the long-standing cooperation between Fogra and JUST, the old fluorescent lamp based Virtual proofStation has been replaced by the allnew LED Virtual proofStation, which is perfect suitable for soft proofing workflow. The new color matching station comes with new dimmable LED based color proofing light with the calibrated light sources D50 and D65 (CIE). The JUST products are the first color viewing lights to receive the prestigious award and the only ISO 3664:2009 complaint LED based products in the market today. Configurable with either symmetrical or asymmetrical light distributions, a wide variety of products sizes and styles include tabletop viewers, viewing booths, viewing walls and complete harmony rooms. 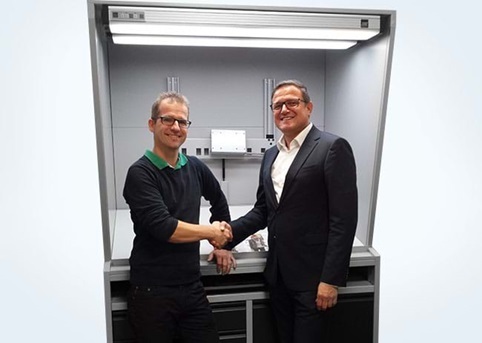 The new JUST Normlicht LED proofStation 20 SP wins the EDP-Award in the category „Special Solution“. The LED-based color viewing station for visual color evaluation of proofs and prints doesn’t need fluorescent lamps anymore and annual relamping. The switchable light between D50 and D65 according to ISO 3664 and ISO 3668 is impressive to the jury. The jury praise the LED proofStation 20 SP as “Great solution not only for digital printers. It is flexible in terms of standardization aspects and light which will be more and more important as well for digital printing in all the different applications“. After four days, a very interesting interzum show draw to a close. The products on display ranged from fittings, surfaces and decors to textiles, glass and lighting all the way through to innovative materials. 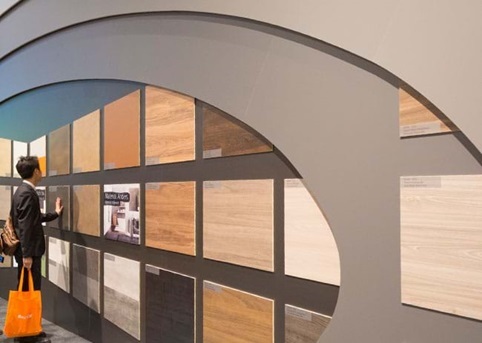 We were one of the 1,732 international exhibitors and presented color matching solutions for just this kind of colored substrates and surfaces. For those who were interested in the color assessment of decors and edgebands, we presented our standardized light booths for visual color matching. The color viewing box with up to five illuminants (D50, D65, TL84, A, UV-A) provides standardized viewing conditions in terms of light quality and viewing environment. We also introduced our new LED-based color matching luminaire – JUST LED moduLight (Pat. No. US 8,592,748 B2). Visitors were able to switch between the standard illuminant D50 for visual color assessment according to ISO 3664 and D65 for color matching to ISO 3668 as well as turn on/off UV radiation by a push of a button to detect substrates with OBA (optical brightening agents). 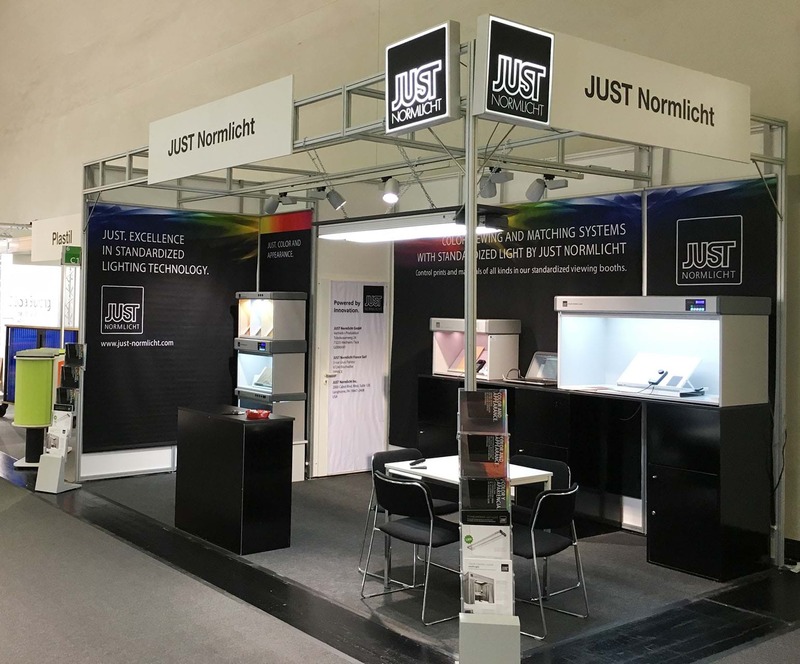 We would like to thank all visitors for the numerous discussions at our booth about standardized lighting and look forward to a reunion at interzum 2019. JUST products were presented at both Delta E Cero and ECI Color Consulting who demonstrated both the new LED Tabletop 3B viewer and the LED moduLight 2-1200 color critical viewing solutions, both which exceed the requirements of the strict ISO 3664 and ISO 3668 specifications. The response was particularly strong from flexographic, offset and digital printers focus on packaging and consumer goods. 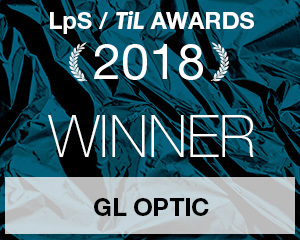 Since the last event three years ago, the plastics and rubber industries welcomed a wide range of innovations from JUST in the field of visual color viewing. Over 230,000 show visitors assessed the lastest in products and technologies for the assessment of colored plastics and surfaces, including both conventional fluorescent lamp and new LED-based systems (Pat. No. US 8,592,748 B2). Experts in quality assurance, R&D, retailers and marketers alike, appreciated the wide range of solutions configurable to any viewing environment. While portable viewers appealed to mobile workers, the revised Color Control Center multiLight, a complete “visual assessment room-in-a -box“ was a real eye-catcher, allowing controlled assessments of large colored plastic substrates to industrial standards as ISO 3668, DIN 6173-2 and VDA part 8B/8C. Many visitors were impressed with how readily metameric colored substrates could be identified while switching among different illuminants of the Color Control Center (D50, D65 and A). 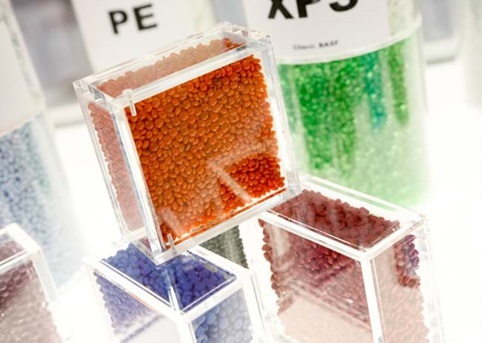 Metameric colors, ones that appear color-balanced with one illuminant but different with an other illuminant, are particularly problematic in the plastics and rubber industries. Since 2001, JUST Normlicht has been working side-by-side with the Fogra Forschungsgesellschaft Druck e.V. in the development of color communication standards. 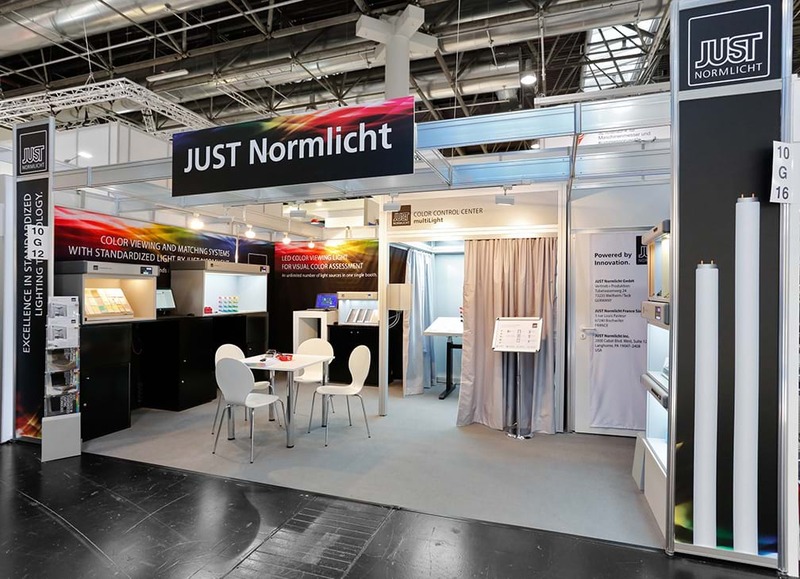 Fogra now honors JUST Normlicht for 15 years of partnership. "The certificate can mean only a small gesture that honors your commitment to the collective research," says Dr. Eduard Neufeld, Fogra Managing Director and head of the institute. 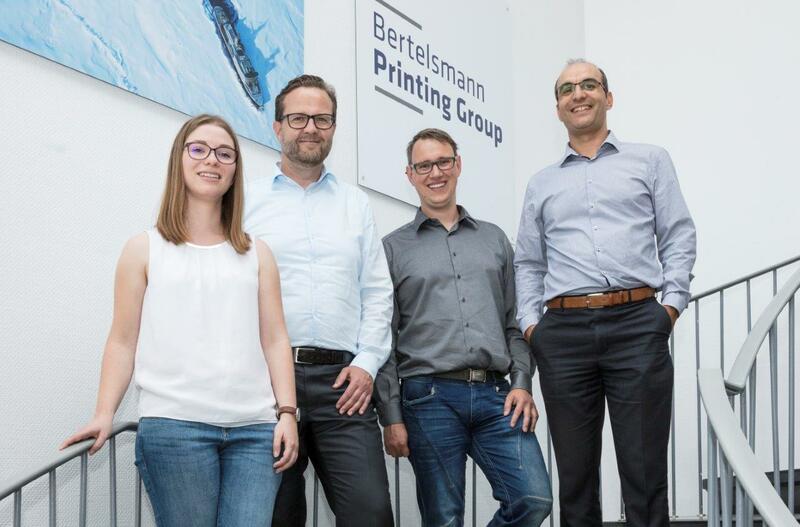 JUST is proud to contribute our expertise in color and appearance for standardized print workflows, and we look forward to continuing the successful collaboration. Color viewing devices from JUST are Fogra certified to meet the ISO 3664:2009. Representing a full range of label applications using wide and narrow web flexo and a plethora of digital technologies, attendees from US, Canada, Latin America, and as far as India and Japan were eager to learn how JUST could help improve their color critical viewing conditions and exceed requirements for ISO compliance. Many thanks to visitors and numerous discussions about standardized lighting. For sure you already noticed: a lot of things have changed on our web site! 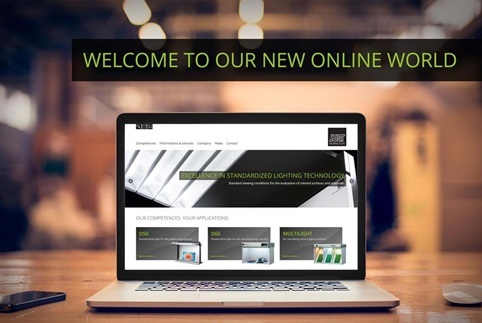 Both the design and the content have been completely revised, making it easier than ever for you to find a suitable standardized-light solution. 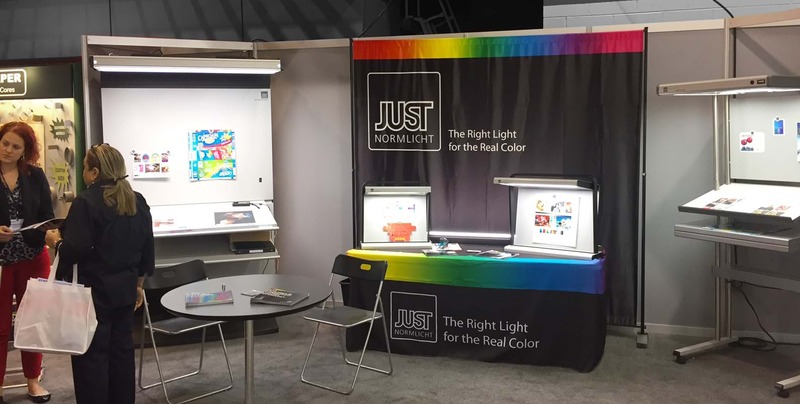 Alongside items concerning the latest Trade shows, New Product presentations, or the FAQs section, the site offers you lots of useful information about color matching technology and the interaction of Light and Color. The product range is presented in the restructured Online Shop, where just three clicks and some helpful text modules are all it takes to guide you to the appropriate product group. 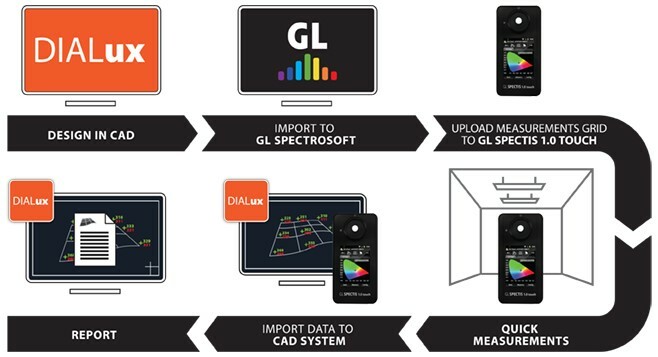 Icons and images illustrate equipment functions and features at a glance. If you are still not sure when looking for a product just turn to the Product Finder Tool for help. 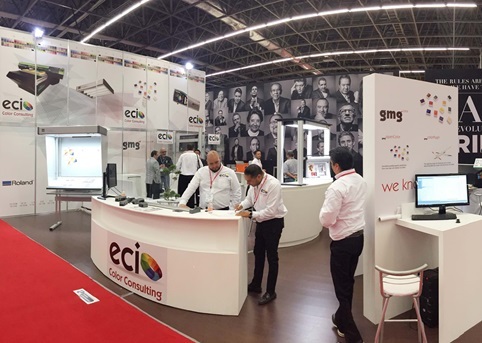 Over 260,000 visitors from 188 countries converged in Düsseldorf Germany to see and learn about new products and developments in the printing industry. For JUST customers and visitors, visual color control and assessments to ISO 12647-2:2013 with LED lighting (Pat. No. US 8,592,748 B2) were paramount. 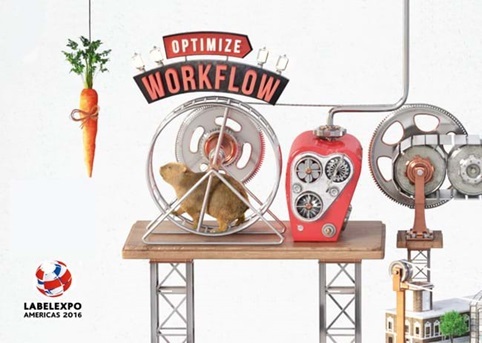 Following adoption of the new standard ISO 12647-2:2013 for a standardized offset printing process, the prerequisites for its practical implementation have now been fulfilled. 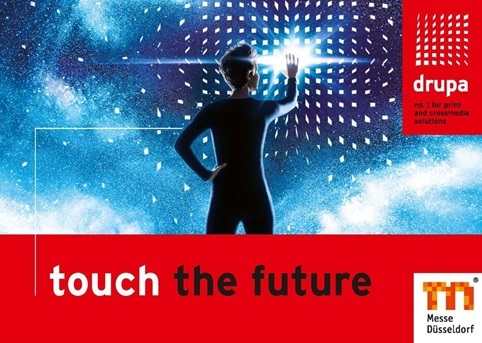 In the form of FOGRA51 for coated papers with moderate fluorescence, and FOGRA52 for uncoated papers with high fluorescence, characterization data for offset printing are now available with corresponding ICC and Device-Link profiles. The definition of measuring condition M1 in ISO 13655:2009, the standard for spectral measurement and colorimetrical computations, created a further important prerequisite. With illuminant D50, measuring condition M1 is based on a higher UV component, this being necessary for measuring papers containing optical brighteners. 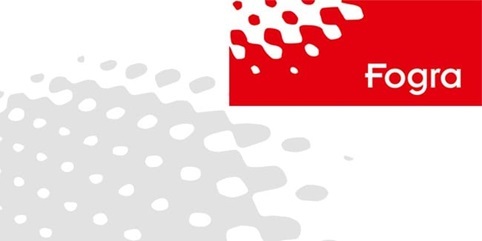 The updated ISO 3664:2009 is an important standard in connection with the practical implementation of ISO 12647-2:2013 for standardized printing with papers containing brighteners. The standard for visual color matching is of essential importance in this context. The requirements of ISO 3664:2009 regarding a limited metamerism index in the UV range, and the closer adaptation of the UV component in the spectrum to daylight, have already been met by the JUST daylight 5000 proGraphic fluorescent lamps from JUST Normlicht since 2010. As a result, all JUST Normlicht devices comply with ISO 3664:2009, meaning that, in combination with an M1-compatible hand-held measuring instrument, what you now see really is what was actually measured beforehand. Consequently, there is no longer anything to stand in the way of standard-compliant color matching in accordance with the new process standard.